Al and Candace Vigen, of Vigen Construction, Grand Forks, North Dakota — significant financial contributions. Joel Guerreo, Rio Grande City, TX — networked for building materials and potential in-kind donors. Texaco Oil Inc. — donated the 115 ranch acres. Cemex USA – donated all of the cement for the first three buildings. Luis Figueroa, of the Rofa Architectural Firm in McAllen, TX — donated services as architect and project manager for the overall development of the 115 acres. 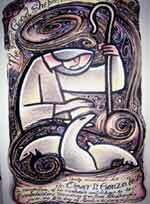 The 2006 Good Shepherd Award, by Mario Serrano. While living in Rio Grande City, Mario, along with his friend Jose Calderon, also designed and made the tabernacle in the Adoration Chapel. Dr. Omar David Gonzalez, of Nuevo Progreso, Mexico — for his 14 years of alternative health care. Bud and Dorothy Curwick, of Rush City, MN — volunteers for 13 years. Bud assisted in the building of the Chaplain’s house, the Adoration chapel, fireplace, and installing the incinerator. Dorothy led the project to create the twenty beautiful quilts in the bedrooms. Mario Serrano — Recipients of the 2006 Good Shepherd Award received the artpiece shown at the top of this page by Mario Serrano, the international award-winning artist from the Philippines. Fr. Jerry Felion — has offered his priestly ministry with daily Mass and the Sacrament of Reconciliation for ourselves and for our guests. He is one of our first Benedictine Oblates. Jim Moffitt, McAllen, TX— donated materials, such as sinks, faucets, toilets, fans, a jacuzzi, wrought iron outside fixtures and the labor of his company’s electricians and plumbers. Oralia and Arturo Garza were honored for their great assistance when we first came to Starr County in 1989, where they welcomed us and helped us in many ways, such as allowing us to use their new Bronco for a trip to Minnesota in lieu of our older vehicle. 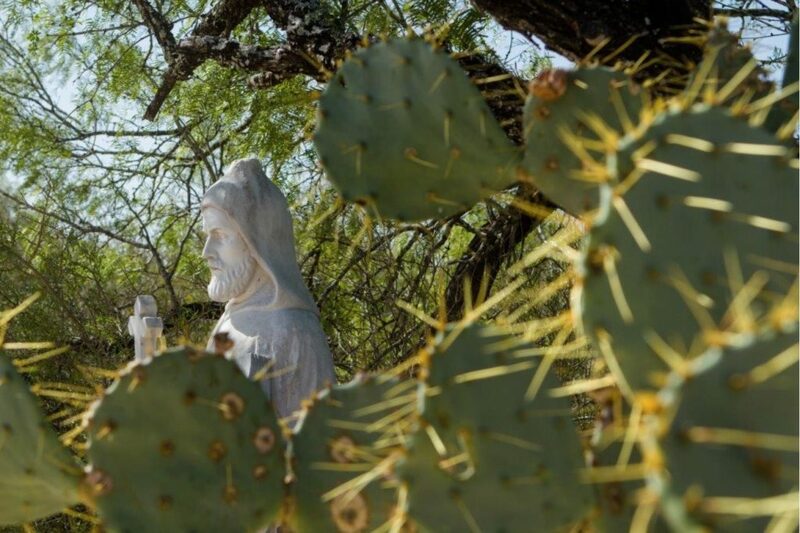 Some projects they had a hand in were the remodeling our first monastery-owned building in El Sauz, constructing our water line, and building our fence along with the foundation for Casita Blessed Marmion. They took us under their wing when we came without knowing a soul. Mike Givilancz was honored for his tireless and faithful work on our first monastic residence. When we were in Weslaco at St. Pius, he said he would build for us when we were ready. He kept that promise and was here on site in the heat of the Texas summer, driving daily from Weslaco to help us build. Ruben F. Solis Jr. was honored because of his commitment to the work of God. He participated at daily Mass in McAllen, where Tony Garcia asked if he would like to help us. From then on, he has been at our side. He found truckers to haul the MANY loads of caliche for the developing roads, a contractor to lay the foundation of the Fountain of Life Adoration Chapel, and led our development council and fund-raising projects. The dreams that the Good Shepherd has planted in our hearts continue to unfold. Praise to the Father, the Son, and the Holy Spirit! THANK YOU FOR BEING A PART OF OUR DREAMS! !